A man charged with cocaine possession claimed police officers lied under oath during a Campbeltown trial. 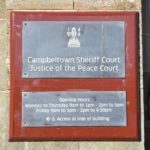 On Monday, at Campbeltown Justice of the Peace Court, Argyll Community Housing Association customer services assistant Ryan Anderson, 27, of 43 Lady Mary Row, Campbeltown, pleaded not guilty to one charge of possessing class A drug cocaine, on August 2 last year, in Kirk Street. Two police constables, PC John McGeachy, 42, with seven years’ service and PC Gillian Watson, 36, with three-and-a-half years’ service gave evidence for the prosecution. PC Watson described how she had been in the passenger seat of a police van at 8.20pm in Kirk Street. PC Watson said: ‘As we were going along I saw Anderson had a small snap closure plastic bag with something blue in it. Both officers said that Anderson ran into the Masonic hall in St John Street where there was a party. About a minute later having parked the van they followed and first looked in the toilets before spotting Anderson in a cloakroom area. By Anderson’s feet the two officers noticed a plastic bag containing white powder and a credit or debit card. PC McGeachy said that Anderson appeared to be under the influence of alcohol, was very animated and could not stand still. Later a forensic scientist analysed the powder, which was produced in court, and confirmed it was 0.25 grams of cocaine. Anderson told the officers that the bag did not belong to him. PC McGeachy replied that it was Ryan Sharp. Anderson, appearing in a suit and black tie, gave evidence on his own behalf and told the court that he had been attending a 50th birthday party at the Masonic. He said: ‘At about 8.15pm I went outside for a cigarette on St John Street. Anderson added that he headed back inside to the bar and had time to order a drink before speaking to the officers. Cross-examining Anderson, procurator fiscal depute Kevin Docherty, said: ‘You knew full well the police officers had seen you up to no good and you panicked and ran. Ms Pollock said: ‘The constables have made an assumption because the name on the card was Ryan. ‘He did not flee the scene. They made no investigation as to whom the card belonged. Giving a guilty verdict, after a short adjournment, Mrs McDowall said: ‘I found the two constables credible and reliable. Ms Pollock asked for a social work report on Anderson and said that the conviction had the potential to affect his work although he was hopeful that his employers would let him keep his job. Mrs McDowall said: ‘Campbeltown does have a serious drug problem.